GOOGLE \'WHAT DO YOU LOVE?\"
Google quietly launched a new website a few weeks ago called What Do You Love, otherwise known as WDYL. Today, the company made it officially by announcing it on the Official Google Blog. The new search tool combines almost all of Google’s services into one page. According to Google, the goal was to find a way to connect people to products they might not know about and may find to be practical while still making the discovery applicable to them and fun. The result was WDYL, a website that showcases how varied Google products can show you different things about a particular search query. For example, typing in the word “ice cream” will give you multiple results separated on various panels that are all displayed on one page. You can start an ice cream discussion group with Groups, you can read the latest news about ice cream with News, you can find books about ice cream with Books, and so on. Other services available via the web page are Calendar, Voice, Image Search, Moderator, Trends, YouTube, Gmail, SketchUp, Blog Search, Google Maps, Alerts, Patent Search, Translate, Mobile, and Earth. Clearly, there’s a lot you can do with WDYL. It works better with more general terms. However, I entered the name of a member of my favorite band, as well as the name of the neighborhood I live in, and was surprised at the results I got. I actually was able to find information about him that I didn’t know. However, to make the most out of the service, it’s best to enter broader topics, like “cheese,” “soccer,” “food trucks,” and so on. Some of the children's social-networking sites that are out there make a big deal out of being for kids only, as if allowing kids and grownups to interact is inherently dangerous. It's not. If it were dangerous for kids to be around adults, they would never be around teachers, coaches, or even family members. The issue isn't who kids are hanging out with, but how they are treated by them and how they behave around them. Of course, we don't want our young children to be hanging out online with random strangers, but I think it's a great idea for them to be able to interact with family members and other trusted kids, teens, and adults, including family friends. That's why I'm in favor of Facebook finding a way to admit children under 13, though I know it will be a challenge for the company to do so in a way that isolates kids from marketing hype and potential privacy intrusions. And it would have to comply with COPPA (PDF)--the Children's Online Privacy Protection Act that makes it a federal requirement for parents to provide verifiable consent before allowing children under 13 to provide personal information to commercial online services. Despite a recent comment by Mark Zuckerberg that Facebook should admit pre-teens, people inside the company have assured me that it's not going to happen any time soon. But there's no need to wait for Facebook. There is a new site that does encourage younger children to interact with family members--including older family members and friends. Ohanarama, which entered public beta last month is a COPPA-compliant site designed to bring children ages 5-12 together with other children and adults they trust. 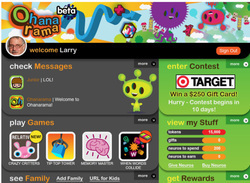 The goal of the free site is to "connect families around the world with a social, fun, all-inclusive online experience."